What is the font used on the CARBONO overlay pack? How can I add the alerts to StreamLabs? Note: on “layout” section, you have to choose the middle one. 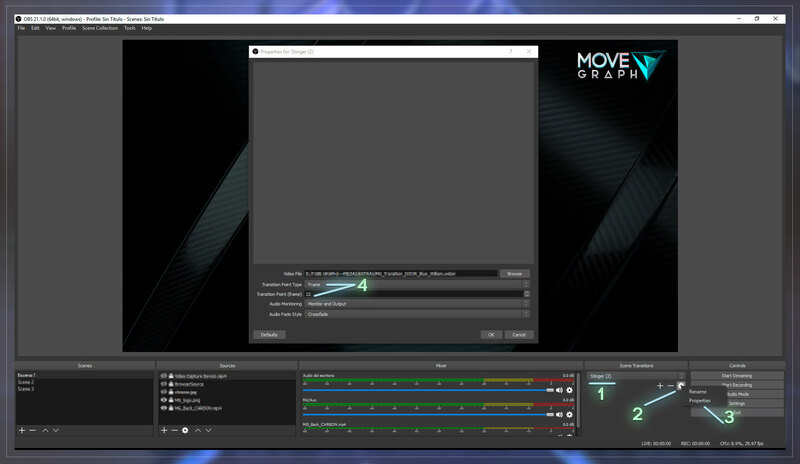 How Do I setup stinger transitions in OBS Studio? 4.- Browse the transition file into the Video File box (the .webm file), choose Frame and assign the frame number in the box, you will find the right number to use in the setting’s image included in the files. 5.- Be sure that “Audio Monitoring” it set to be Monitor and Output. This way you use the audio included with the transition. Important Note: the selected file should be the .webm file included in your purchase for a good performance into stream software. I miswrote my email when placed the order, how can I fix it? Don’t panic! just write us support@movegraph.com or submit a ticket here telling us your order number and the right email to use and we will fix it for you. Just make double click in the overlay layer to open the properties box and be sure you activated the LOOP option. I open the animated files on a video player and they look damage / wrong, why? Is important to tell you that every item is tested before being uploaded to the store. If you open the animated files in a video player and it displays big blobs / glows, black background and it doesn’t look like the showed item it is completely normal, it happens because they have inserted an alpha channel to make them work properly within the mentioned software for which they were created (OBS, StreamElements, XSplit. We always advise to check the compatibility in the description of each item), but if you set up the files in any of these software you will see they are fine. In any case, we recommend having the software updated to the latest version so that they look the right way. If the issue persists dont doubt to write to support@movegraph.com to help you. I love your graphics, do you make custom commissions? Thanks for ask and we are really happy that you like our graphics, but unfortunately, we do not work with custom orders at the moment. I feel sorry that we can not help you with this right now. We hope to add a custom service for some items in the future. I want to use the overlay items in a different and original way, Is there a way to rotate and transform the pieces? Yes! you can rotate, transform and flip the pieces inside OBS Studio just following the next steps. 1- Select the layer of the piece you want to edit in the Source panel. 2- Right click on the layer and go to Transform. 3- There you find all the option to rotate the pieces as you want.